I've been taught my whole life to set goals. Measurable goals. Results-driven goals. And it works. In many ways, strategic goal-setting has made the difference in my life between moving forward and standing still. But the thing is, some of us need magic. 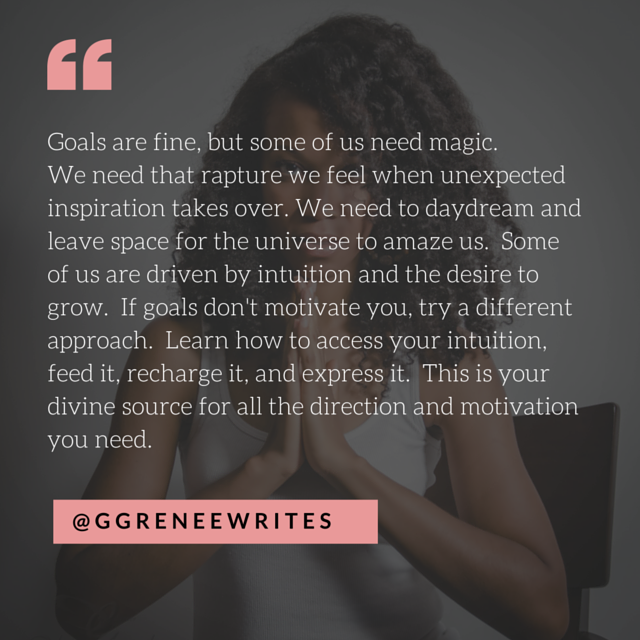 We need that rapture we feel when unexpected inspiration takes over. We need to daydream and leave space for the universe to amaze us. And I know now that this is why goal-setting, checking things off, and then goal-setting some more, always felt empty and unsatisfying to me. When it comes to your life, goal-setting can feel restrictive, like it's squeezing all the juiciness out of your journey. For a long time I was stagnant because I didn't know exactly what I wanted. My intuition whispered, and I could sense it, but there was nothing concrete to act on. I was looking for certainty and all I found were hints and breadcrumbs that weren't substantial enough to command my attention. If you would have asked me about my goals, my answers would have been lukewarm. Full of should's and supposed to's, painting a picture that didn't come from my own vision. I didn't understand how I felt so ambitious and so lost at the same time. I started trusting my intuition out of desperation. I was miserable and finally open to the idea that what seemed to work for other people, may not be what would work best for me. If someone tells you that something should turn you on and it doesn't, you can't force it. But you can open up to your curiosity and start figuring out what does. You can turn your attention to those hints and breadcrumbs and start following them, on purpose. But we do need discipline and we do need to have plans and intentions, right? Yes, but for those of us who hear the music differently, we need to take a more fluid approach. If you ask me now about my vision for my life, you'll have trouble shutting me up. I'll tell you about the backed up creative energy I have inside and how I'm obsessed with releasing it into the world. I'll tell you about how much I want to learn and grow and experience. I'd give you some background on how I used to be, how I never trusted my visions or believed that they mattered. If you ask me now what drives me and what dominates my thoughts, I'll tell you what I want most is to grow. And experience life deeply. And capture it creatively. The desire to grow motivates me through my struggles and pushes me past the limitations I used to put on myself.. I don't even think about goal-setting anymore; very much the same way I don't think about mothering. It's a seamless part of my being. It's an awareness that guides me and wakes me up in the middle of the night from the deepest sleep when my child is coughing. It's a knowing that pulls me toward certain opportunities and ideas, not knowing where they will lead, but knowing that's the direction I need to go. The desire to grow motivates me, keeps me active and focused, and it's more compelling to me than setting goals. I'm always open to different possibilities and I don't want to be too attached to specific outcomes. My visions stimulate me and I trust the way they pull me toward what's beyond my physical sight. Being too focused on goals can narrow your journey down to accomplishments, which are great, but the best part of them is getting to see who you're becoming in the process. If goals don't motivate you, try a different approach. Trust your intuition and consider letting yourself flow naturally, so you can find a rhythm that keeps you moving and makes you feel part of something bigger. Learn how to access your intuition, feed it, recharge it, and express it. This is your source for all the direction and motivation you need. Is there anyone out there like me, who's ambitious but totally uninterested and unmotivated by setting goals? Share with me in the comments.